I've been mulling over where my time has been going lately. It's slipping through my grasp all too quickly, but then it gels up in the middle of the day and geez, I just want a nap around 3:00. I'd give a leg to check out for an hour there. Well here are some things that I've spent time on. They're mostly all ridiculous. They would be all organized in a pie chart, but I spent time eating Ritz crackers & catching up on Downton instead. Oooops. I'd like to also claim these items are listed in some sort of order or time value. It might be, but I'd like to give myself some room to get lazy and throw some stuff in last minute. - Twitter. I'm always on Twitter. I should be more embarrassed about it, most likely. - Making smoothies. Then eating under-the-table twizzlers that I don't log into the calorie counter. CHEATSIES! - Standing at the park watching my 4 yr old and my friend's 2 yr old try and score a basket on the real basketball courts with their plastic neon color balls. I spend hours there. I wish there was a way to incorporate exercise for me as well, but alas, no. - chores. I've found a loophole, though! I listen to podcasts while I have to do the dishes, make dinner, or mop the floor. I check the heck out with my earbuds and it's exactly like watching TV, while getting stuff done. - actually watching TV. I'm doing less of this lately because of the Olympics. - speaking of podcasts. I've been using them to drown out the accursed Frozen soundtrack, both the one on itunes and the version sung at very high pitch and off key by all three of the shorties in this house. Those songs were great... the first zillion times I heard them. Now? The bane of my existence. Hopefully taking them to the Lego movie this weekend can water down the Frozen dedication at our house. - washing loads of wee underwear. ASK ME HOW THE POTTY TRAINING IS GOING. I dare you. - micro organizing. I've decided that organizing the whole house is too big of a job, and it just seems to get disorganized every time I turn around anyway. I tried lofty projects like the pantry which took valuable hours off my life, and looked great for around a month. Now it's back to a different messy state of affairs. So I am taking up the most pathetic little projects. The other day I bought an "appetizer" dish on clearance at Target for a dollar. 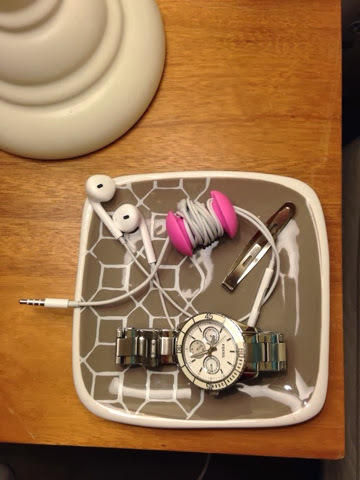 I put it on my nightstand to hold my earbuds, watch, and a hair clip. That is all. BAM. ORGANIZED. 1 square inch of my house looks ADORABLE. Camera ready, even. - Reading. Then reading some more. Then LEAVE ME ALONE, CHILDREN! CAN'T YOU SEE I'M READING? What do you mean, you want to eat AGAIN? You ate once already today? - playing a dangerous game of chicken with my shower, just HOW long is too long to go without washing your hair? LET'S FIND OUT! I've disturbingly lost all drive to look presentable or decent any more. I'm sure it's just a phase. Hopefully. Perhaps it's because the shower reminds me that I need to scrub the bathroom down... and WHO WANTS TO BE REMINDED OF THAT? - combing GoodReads for more book ideas. I desperately want to find a copy of The World We Made by Johnathon Porritt. (remarkably elusive! Trent thinks entirely made-up) I'm also considering Arcadia by Lauren Groff, and Make Good Art by Neil Gaiman as my next reads. Nothing is easier than clicking "to read." The actual reading of these books... we'll see how much real life work I can put off and ignore. - speaking of list making. MAKING SO MANY FREAKING LISTS. Ridiculous little lists. Let me run down some of the better ones: migraine journal, (for myself and the kids) favorite quotes from the books I'm reading, names of new subdivisions being built in the area whose signs I see and want to go look at the floor plans for, witty names for future pets in case the current dogs kick the bucket soon, perfumes I've heard about (I don't wear perfume), then the catch-all "things I want" this list includes various night cream serums I see in catalogs, a steam mop complete with model number, and a waffle iron that makes heart shaped waffles. Then there are the completely run of the mill Target, Sam's Club, HomeGoods, and Grocery Store lists. It's sheer madness. - it certainly hasn't been spent BLOGGING! But I have been dutifully READING blogs! - waiting at the bus stop in my pajamas for the girls. Whether it is in the morning or late afternoon, chances are I am in my pajamas. It's KLASSY. Bonus points if I'm busted wearing the same pajamas in the afternoon as the ones I dropped the kids off in the morning. It so happens.